Powers/Abilities: Captain Hot Wheels is a very skilled driver, capable to perform any kind of stunt with any kind of car or truck. His skills are improved by a radar helmet which allows him to perceive any danger with computer-like precision and consequently make maneuvers that would not be possible otherwise. History: Billy Car, a young mechanic with great driving skills furtherly enhanced by a radar helmet (it is unknown how he got it), decided to use them as Captain Hot Wheels to help the police in keeping the order. To avoid other people suspect his identity, when he is not in his Captain Hot Wheels outfit he pretends to be afraid of speed and to be interested purely in the technical aspect of motors. 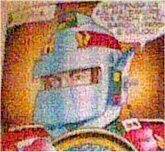 Comments: Captain Hot Wheels was created by Sauro Pennacchioli in 1989 and appeared in the comics magazine Magic Boy, which was entirely sponsorized by Mattel Italia. Every issue of Magic Boy collected several comics, some of which were about Mattel characters (Bravestarr, Masters of the Universe, the New Adventures of He-Man) and some others were about original characters (Video Boy and Captain Hot Wheels) but had something to do with Mattel anyway. In the case of Captain Hot Wheels, the focus of the comics were the cars, which were reproductions of the Hot Wheels model cars. Thanks to "Devil Master" for informing me about this character, and sending me a write-up and image of him.